As In the Spotlight week continues, we turn our attention to the outward accoutrements of a Fairy Princess. (Fairy Princesses are very particular about their royal attire.) It is, of course, essential for a Fairy Princess to have a crown, wings and … a WAND! I have a Fairy Princess wand. So has Geraldine. It helps us remember to let our SPARKLE out. Mine was made by a talented woman in Minnesota, Patricia Jensen. You could have one of Patricia’s wands, too, since Patricia created the wand that I’m giving away as part of the Fairy Princess Grand Prize this week. I’m delighted to be interviewing Patricia on my blog today, so that you can get to know a bit about this very creative woman. Welcome, Patricia. Thank you for joining us for this interview today. Could you tell my readers just a bit about yourself to start with? What is the life path that brought you to the point you’re at today? When I was young I watched my father fix, paint and build just about anything. My mother would sew, cook and bake. They were both very creative. I love figuring things out and making things work, being creative. I have been a massage therapist for about 20 years. I love working on people and making them feel better. I also love to cook and bake. How did you get started making wands? I have given a few tea parties for a young friend of mine in the past. Last year when she turned 12 I wanted to do something special. A friend and I came up with a Fairy Tea Party theme. We had 9 friends from ages 12-62, good tea and food. After tea, we got out the makings for fairy wands. Each person made a wand that was different, beautiful and magical. It was a lovely afternoon. I enjoyed it so much I made a wand for a friend, then she wanted a wand for a friend and it went from there. What is your favorite thing about creating these delightful wands? Each wand takes on a magic of its own. Without telling us too many details that would give away your whole process, how do you make each wand unique? As I am making a wand I am thinking about the person who it is being created for. So I like to know a little about the person. I will pull out 15 to 20 different doodad and foo-foo and maybe 6 to 8 will actually want to go on the wand. Further to that, I know that you have, up to this point, made each wand with the particular person in mind. Will you still try to do this as your business expands? Yes, to make a magical wand I must know something about the person the wand is being made for. I understand that at some point you may be making wands for others. Is this the case? In the near future I will set something up. I am not quite ready. I hope you’ll let me know when you have something set up, because I’m sure there are fairy princesses of all ages who would love to have a wand as beautiful as the ones you make. Thanks again, Patricia, for this glimpse into the process of creating a one-of-a-kind fairy princess wand. 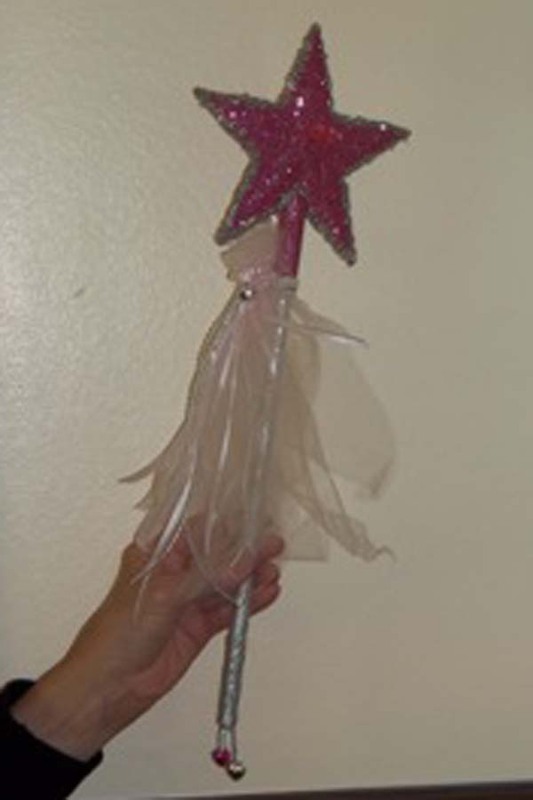 And thank you VERY much for creating the wand (pictured below) that is part of the Grand Prize package in the fairy princess giveaway this week. GIVEAWAY Reminder: If a copy of The Very Fairy Princess: Here Comes the Flower Girl and a Fairy Princess Wand might help you let your sparkle out, remember that everyone who comments on any post this week will have their names added to the draw to be held on Sunday, April 29. Grand Prize is a copy of Emma’s and Julie’s new book and a fairy princess wand made by Patricia Jensen especially for this giveaway, second prize is a copy of the book. Isn’t the wand great? I have one (it looks different than this one — Ms. Jensen makes each one individually to suit the person) and I love it! I need a wand! It does clean up after my kids, yes? oh, erik you are bad! i will be seeing patty today and will ask if she does special wands for guys. i do know her son and husband each have one so you just might be able to get one, too. Thanks so much for checking with Patty about wands for guys! I think that would be so cool. I’m with Erik. WANDerful! The wand is great. I love that each one is unique. 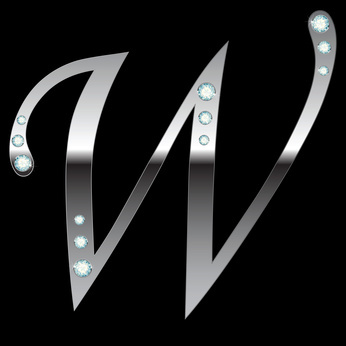 Our sparkle is different too. Oh — what a great comparison, unique wands, unique sparkle, unique people. Thank you, Stacy! Lovely post today. It is amazing how the Alphabet cooperated with your week — or you are just a stellar writer. 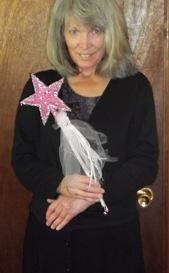 Love the wand, and so would my almost 6-year-old great granddaughter (May 31). Patricia might want to check out Martha Stewart’s program (Hallmark station) today, because they focused on people who make products that sell through a crafting company. Today is all about crafting — so you won’t guess what Julie will be making with Martha tomorrow! Thank you, Pat. I was so delighted that I was able to work my week’s focus with the letters. Wish I could see the Martha Stewart show! Hello, Beth! Your blog is delightful. What a great guest post! Patricia, you’re so creative and I love your sweet fairy princess wands!! Thank you so much, Laura, and thanks for dropping by. 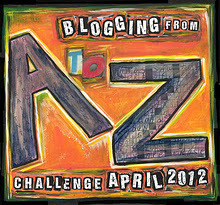 Hope you’re enjoying A to Z! I think everyone needs a fairy princess wand! Thanks for checking that with Patty, Jan!